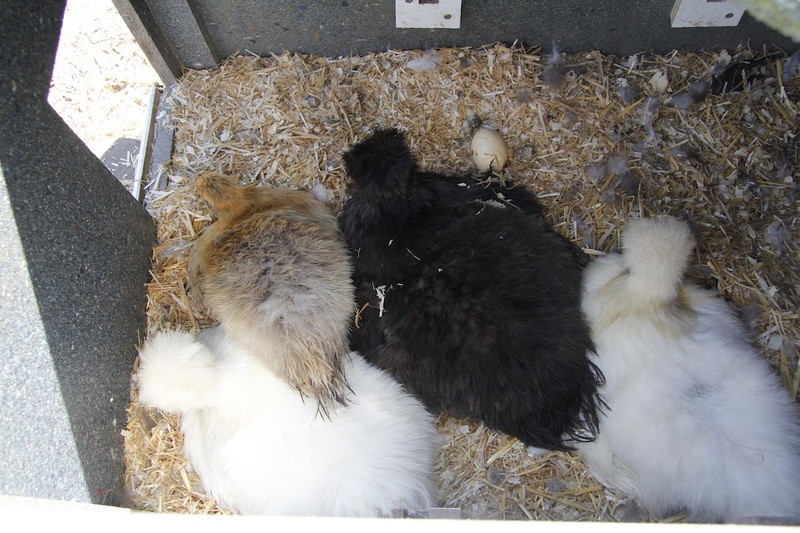 The turkeys and silkie chicks are now new best friends. Not only are they hanging out together during the day, but they are sharing their scrambled eggs and also having sleepovers. The turkeys are mainly sleeping in the coop with the silkies, except for one night when they chose to sleep on our porch roof. And then at 4am when they were cold and hungry they peeped very very loudly. We now try and encourage them to go to bed with the silkies rather than perch on the roof as once they are up there we can’t get them down. 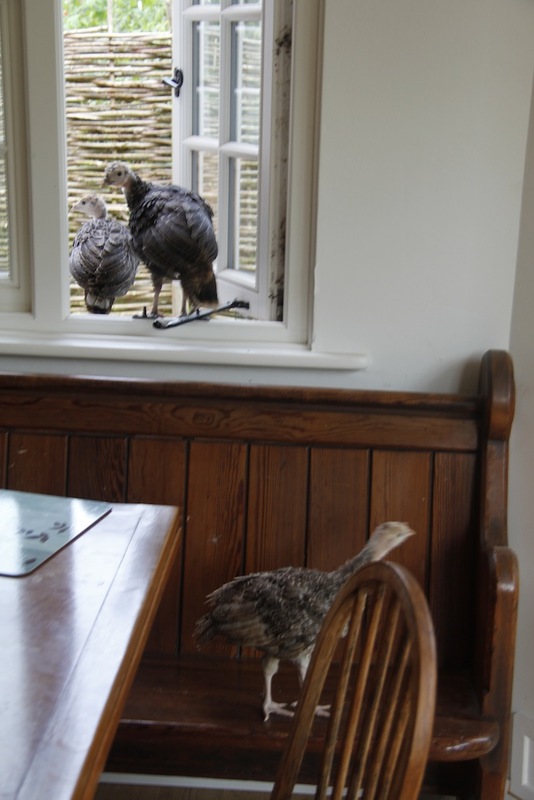 The turkeys though also happen to think that the house is their domain as well – perhaps it was because they spent their formative weeks in the dining room. Anytime the door or window is left open, in they come. 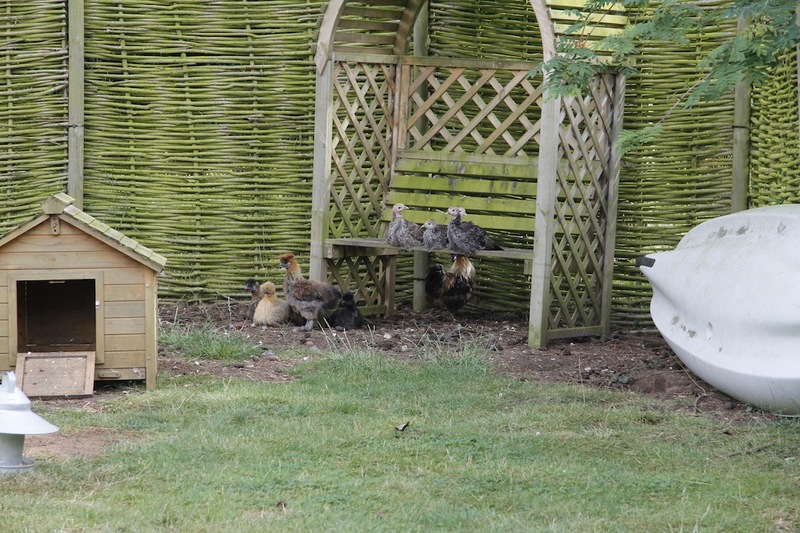 The adult silkies in the front garden are also all sitting on a clutch of eggs. Or rather Bobblehead and Maeve are sitting on eggs and the others are keeping them company. Despite promising to keep better records, I haven’t managed it again. They started laying and sitting quite erratically so there wasn’t a proper first day (this is my excuse and I am sticking to it). I am not sure if any chicks will hatch but I am checking them everyday or so, so we will just have to wait and see. N.B. I am going to candle the rhea eggs in the incubator this evening as they have now been there for 7 days. There really is only one type of Turkey you should have in your dining room- a roasted one! Little do they know that they essentially started their life in the dining room and they will end it there as well – albeit with loads of lovely foraging, exploring and general misbehaving in between. 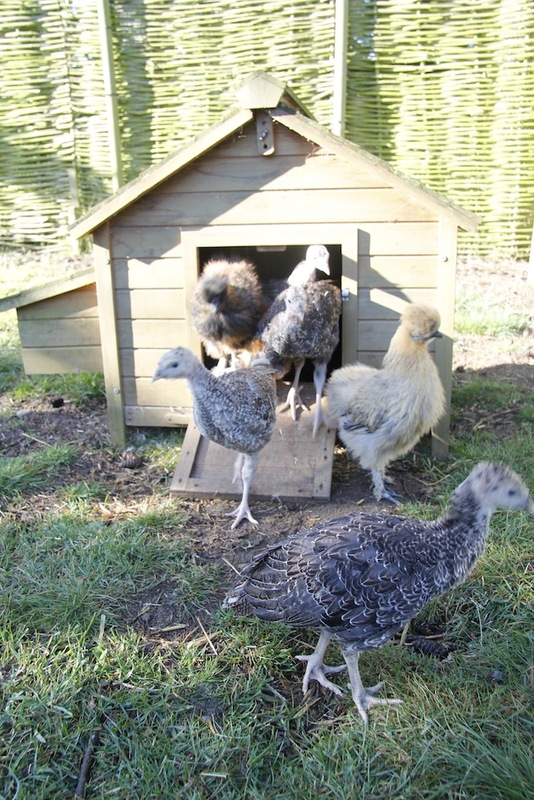 I should have added that the turkey chicks are regular escape artists and are constantly getting over the fence into the driveway and the road! Do you need screens in your windows? The flies and mosquitoes would drive us, well, buggy if we didn’t have screens (USA). We are lucky and don’t have too many mosquitoes. We have a lot of flies though. We have an electric zapper thing in the kitchen (similar to that you find in commercial kitchens) and we also have this fly trap thing outside that lures them in to their death. 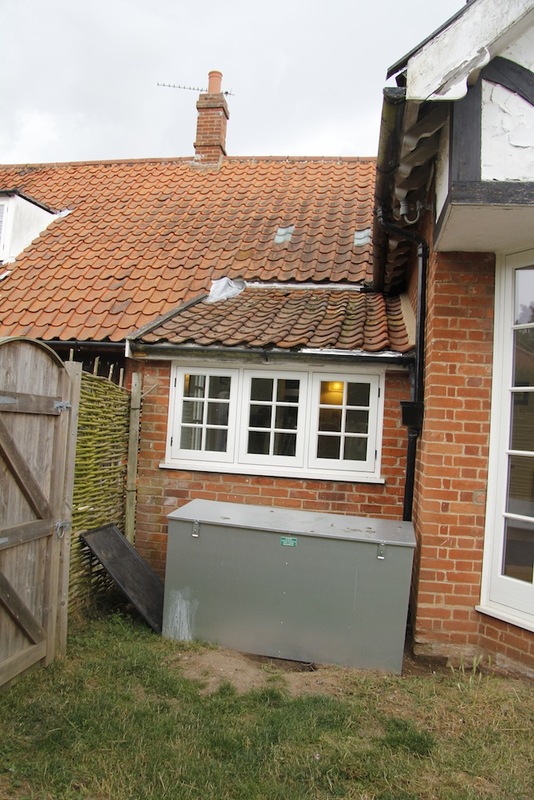 I might take a photo of it for those interested – it is totally revolting, but it keeps most of the flies away. The only time I wanted screens was when we got invaded by hornets – that wasn’t fun. Thanks for the information. So interesting! A photo would be great! Busy bird time. Thanks for the update. Love hearing the progress. 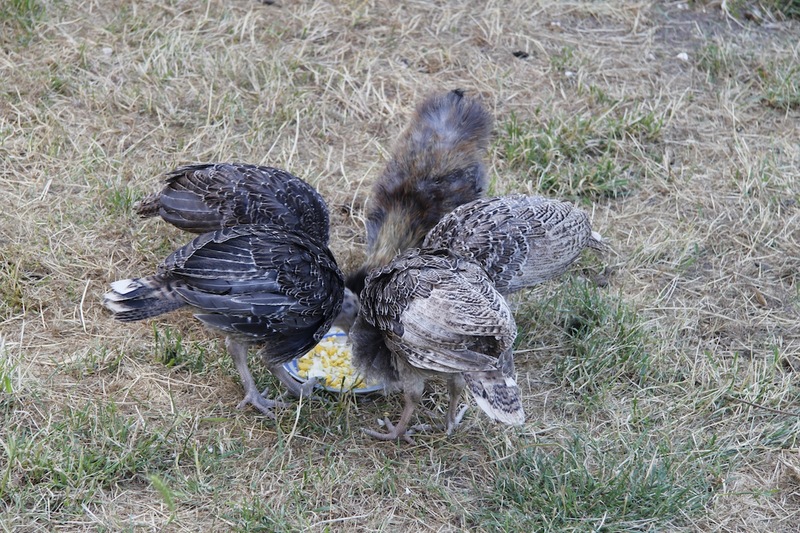 Very busy and I moved turkeys and hens again last night – another update to follow soon….